This is the movie we've been waiting for. What we have here is absolutely brilliant filmmaking that could only come from the brother directors, Joel and Ethan Coen. The audience I saw it with probably felt the movie was was a simple, conventional suspense thriller, one full of bloodlust and vengeance with an unsatisfying ending. I know this from the grumbles and groans I heard leaving the theater. These people, however, are terribly misguided and obviously shouldn't have been seeing it to begin with. So, have no worry, "No Country for Old Men" is an undeniably great movie. It's stunning, assured, intelligent, and even if December has yet to deliver probably some of the season's best movies, I can safely state that this is the very best film of 2007. The movie takes place in the barren countryside of West Texas in the 1980s, and it opens with the solemn voice of Tommy Lee Jones. He explains about a 14-year-old boy who killed his girlfriend in what the papers called a crime of passion. When he sent the boy to the electric chair, he asked him about the murder, and the boy responded that it had nothing to do with passion; he had been thinking about killing someone for as long as he can remember. The tone of this story sets everything up perfectly for the rest of the movie. Jones' character is a sheriff and he, along with the other sheriffs, doesn't understand the crimes of today. Other movies have used war to describe dehumanization, but this film is above preaching. This certainly is no country for old men, and no country for any man, for that matter. And to think out there is a man of such incomprehensible evil. The man is Anton Chigurh (Javier Bardem), and his presence on the screen can silence and chill a theater. He carries with him the worst hairstyle imaginable and a tank of compressed air, a cattle gun. This is a man who quietly asks his victim to get out of a car, and then proceeds to place the device on the man's forehead, blowing a hole through his head. Chigurh takes care of his victims calmly without breaking a sweat. And he can easily repair whatever wounds he receives. He is the scariest villain to come along in a movie for a long time, one of such dark evil with just a hint of perverse humor and also a smile that makes your skin crawl. 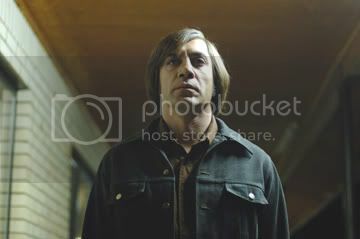 In one scene, Chigurh enters a lonely gas station and, unknowing to the old man he's speaking with, they begin talking about whether or not Chigurh will kill him. The killer retrieves a coin from his pocket, flips it onto his hand, and tells the man to call it. The stakes are drawn, and this is Chigurh's game; he gambles with the lives of others through a coin toss. It's scary, that randomness in life. And then there's Llewelyn Moss (Josh Brolin), who, while hunting in the vast expanse of prairie, randomly comes across the site of a drug trade gone wrong. There are abandoned trucks surrounded by dead bodies, even dogs, and a truck bed full of heroin. But, where's the money? Moss follows more tracks to find it in a briefcase, all $2 million of it. Amidst the carnage is also a man begging for water. After stopping at home to tell his wife (Kelly MacDonald) to stay with her mother, Moss makes the bad move of returning to the site with a jug of water for the man. While out there, a second pair of headlights appears, shots ring out, and Moss is officially on the run. It's not entirely clear how Chigurh is tied to the money, but something is assumed; Moss is attempting to keep the money for himself, and Chigurh is hot on his trail to get it back. In pursuit of the two men is Sheriff Bell (Tommy Lee Jones), who is trying to save Moss from the trouble he's in and trying to stop Chigurh's murderous rampage. There's also a cocky bounty hunter named Carson Wells (Woody Harrelson) who compares Chigurh to the bubonic plague. All of these people understand what they're up against, but they really have no idea how to stop it. The chase takes Moss from motel to motel where all of the clerks get a visit from Chigurh. The suspense is heightened by a persistent and haunting silence. During one scene in particular, Moss waits in the dark for Chigurh to arrive; the only sound is the increasing beeps of a tracking transponder, warning of the approaching mayhem. It's truly scary, and this is not the only scene so flawlessly constructed. There are countless sequences that you don't want to end, but then when they do, there's something even better to experience next. Josh Brolin is excellent as a common man thrust into a hellish world where he believes he's smarter than he really is. Moss is a man possessed by something beyond him, and Brolin adds a much-needed human touch to the role. And Javier Bardem's inexplicable ability to terrify is astonishing all on its own. Then there's Tommy Lee Jones, who is right at home playing the worn-out sheriff dealing with the worst of all evil. He has those tired eyes and long drawl, which is immensely fitting for the role. These three actors make every single line of dialogue count and all give Oscar-worthy performances. Now, as for that so-called disappointing ending, I believe it is pitch-perfect, bringing everything full circle and ending on a fittingly sentimental note that will reverberate in your soul long after the credits roll. "No Country for Old Men" is based on the 2005 novel of the same name by Cormac McCarthy. The Coen brothers have adapted the story for the screen with the infusion of their signature dark humor. This is top-notch writing with a fine script, combining for absolutely great storytelling. The cinematography comes from Roger Deakins, and there's an effectively controlled sense of style, which is hauntingly bleak and violent, yet beautiful. Similar to Joel Coen's Best Picture nominee, "Fargo," the Coen brothers have a certain fascination with empty rural areas and the people who occupy them. This directing duo's latest effort is by far their best work yet. This is a movie that drags you in, and as the minutes fly by, you'll find yourself entirely engrossed without a blink. It's hypnotizing, and at some points, you may even have to remind yourself to breathe. The movie is a meditation on time, the complexity of good and evil, the morality of choice, the immorality of injustice coincidence, and the unpredictability of fate. And all of this is tackled by the Coen brothers in a world that is all their own. The best part is that it's also damn entertaining and, yes, a masterpiece. Don't miss it.